Leicester have secured the services of former Wolves striker Carl Cort. The 29-year-old chose the Foxes over a Premiership club and has signed on a two-year deal after being released. "Carl has quality and I'm delighted he has chosen us over four other clubs - including one from the Premiership," said manager Martin Allen. "I believe I'm going to get the best out of him. I'm going to work him hard and push him to maximise his ability. Then the ball is in his court." 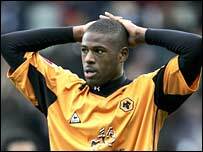 Cort was released by Wolves boss Mick McCarthy at the end of another injury-blighted campaign, having scored 31 goals in 94 appearances for the Molineux outfit. He joined Wanderers in a £2m deal in January 2004 after four injury-hit years with Newcastle. Having impressed at Wimbledon he joined the Magpies in 2000, but following a goal-scoring debut he managed just 22 starts on Tyneside. Foxes chairman Milan Mandaric added: "I'm delighted we have attracted a player of Carl's calibre. He met the sole criteria of what this club is all about."